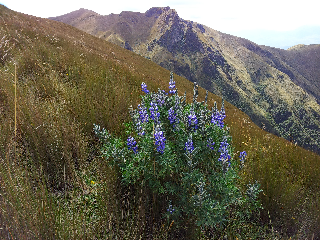 South America 2012: Pichincha, and the centre of the earth. Today we took a ride on the Teleferico to 4200mts then walked up another 200 vertical metres. Acclimatization going well. Glad we've had some time in Quito. Quito taxi drivers are mad. Rides are cheap. Most taxis don't have seat belts and they drive like maniacs. How about 100km/hr in a 40 zone with a policeman taking no notice? Public transport on the EcoVia is extremely cheap at 25 cents for as far as you want to go. We use this every day to get to/from school. We took the taxi to get 40km out of town to Mitad del Mundo, the monument right on the equator and took our photos with the official latitude 0' 0' 0". So we straddled the hemispheres and had some fun taking photos with a foot in each hemisphere. There was also an interesting cartography museum. When you look at the surrounding terrain those pioneer cartographers were amazing. All the peaks they climbed to take measurements, and finally pinpoint the equator. 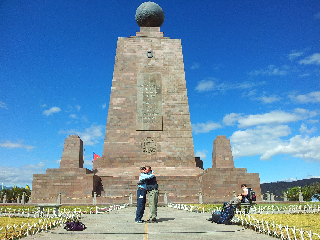 The photo with the blue flowers was taken on our walk up Pinchincha, and the other is David and Jim straddling the equator.